Sonntag Roofing is a full-service roofing contractor specializing in residential and commercial roofing, both repairs and new construction. At Sonntag Roofing, we pride ourselves in helping every family find a roof that perfectly fits their needs. 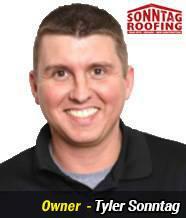 For over 15 years Tyler Sonntag and his experienced staff, have helped thousands of homeowners realize the dream of transforming their homes with a new roof. We are a local family owned and operated company, and our dedicated staff genuinely respects your time, your property and your neighborhood. From our on-site communication to the dailyclean-up on the worksite, Sonntag Roofing goes above and beyond for all of our homeowners. Watch our videos on Residential Roofing. Thank you for contacting Sonntag Roofing, a representative will contact you shortly.